Well at least I can’t be accused of lazy journalism. I went back to Luang Prabang on the 5th of March – and took with me many of the pictures I’d taken there on my previous trip. I was able to find most of the people in the pictures and give them prints – including the kids at the school, most of the apprentice monks and other people that I’d photographed there. While looking for two kids I’d photographed playing on the banks of the Khan river, I met a women with her son who recognised one of the boys in the photo and offered to take me to his village. We passed a small school and entered an even smaller village – where I was handed off to another woman sitting in front of a house in the village at the top of a path that led down to the river. She explained that the boys in the photo lived nearby – but that they were ‘in the river again’. So I sat there and chatted to a few people, several of which had brought their kids to an English lesson being held privately in the house at the top of the path. While talking to a couple of other kids – I asked them if they knew anyone that sold crafts at the night market in Luang Prabang. One of the girls said that her family made silk and cotton fabric that they sold to vendors at the night market as well as to the market at Ban Pa Nom. I asked her if I could see where they made their fabric and she said yes. Her name was Por, and she was there with a friend - Leh. They’d brought their bicycles and decided that I would ride one of them while the two rode tandem on the other. Not wanting to miss a photo opportunity I proceeded to peddle a rather precarious one-handed route across dirt and sealed roads while taking pictures. To the right is a picture of Por (left) and Leh (right) on the way to Por’s home in Ban Pon Sa-at. Por is the youngest in the household with three older sisters and an older brother. 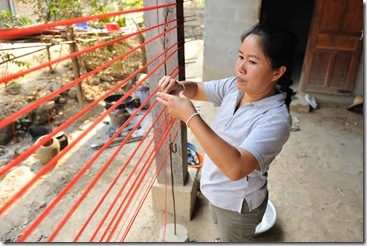 The two oldest sisters Pu and Nic have finished school and weave as well as help out around the home full-time. Ot, the next youngest, and Por are still in high-school. Cam-Noy, their brother, is just finishing high school and is the only one that will go on to a vocational college to study ‘phi-fa’ (electricity). Here’s a picture of the four girls weaving on traditional shuttle looms, Pu (left), Ot (front), Nic (furthest back – just visible) and Por (right). The following day I was able to find a small Kodak lab in town and printed the pictures of the family at their looms and at the house. I called their mother and asked if I could come to visit again and bring them their pictures. She said yes – and while I was there I took a few more pictures and also suggested that perhaps for International Women’s Day (on Sunday the 8th of March) they’d all like to go to the famous Tat Kuang Si waterfalls – not far from Luang Prabang. Surprisingly, considering they’d known me for less than 24 hours – they thought that would be great. I organised a mini-van from the hotel and came back on Sunday to pick them up for our big trip to Tat Kuang Si. There were twelve of us in total (I think) – all of Por’s family, plus several nephews and nieces – all piled into the van. The first thing you discover when taking kids from a relatively small village on a trip in a van along some windy roads – is that they’re not used to riding in vans on windy roads – and about 20 minutes into the trip we had what can only be described as a ‘barf-o-rama’. At one point when we’d run out of plastic bags we had to stop and take a barf break on the side of the road. Everyone was remarkably good natured about it – participants and viewers. :-). On the way back from Tat Kuang Si – we visited Por’s grandparents at their village – set beside the Mekong river not far from Tat Kuang Si. So.. in a round-about way, and while having more fun than I’ve had in ages… I discovered that the local markets, the night market in Luang Prabang, and the market at Ban Pa-Nom just outside of Luang Prabang – do in fact sell the textiles that are made in the homes of Laos villages all across the country. And that the rents paid in the markets are modest - about 8,000 Laos Kip per space per day – about 1 USD – for a space with two light bulbs, and that a fair percentage of the money we spend on crafts in these markets (at least the ones I visited) does in fact go directly to the families that make the products themselves – which is great. NOTE: The roman character transliteration of some nicknames in S.E. Asia can result in a word that would not only result this article being spam filtered – but might be less than kind to the owner of the name when read by those not familiar with the problem; and so the name of one of the girls featured in this post has been changed accordingly.